Moorestown Business Association launched its Spotlight program in 2015 as a means to highlight established local businesses that have had a positive impact on the community. 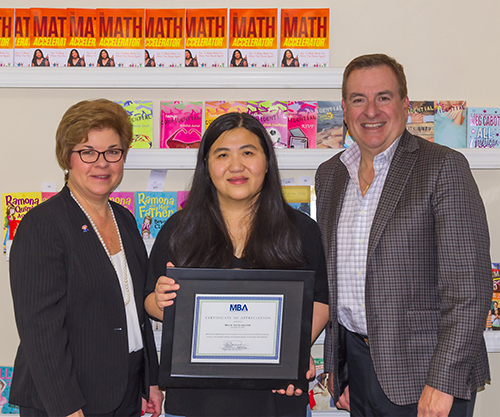 The MBA is broadening the program in 2017 to also applaud new businesses that enhance Moorestown, beginning with Math Accelerator, an innovative math enrichment center that makes learning fun for its students. Kit Wong’s enrichment program is designed to help children master mathematics, so parents new to Math Accelerator may be surprised to find their children full of excitement and reluctant to leave when it’s time to go home. After all, building critical thinking skills and honing math ability is serious business—or is it? According to Wong, learning should be fun because that’s what makes students retain information. Proving her point, a steady stream of eager learners has flowed through her doors since she opened her business on Chester Street in March, 2016. Absent from Math Accelerator’s cheery rooms are student desks and text books. Instead, Wong urges her pupils to wear sneakers and engages them in games that sharpen math skills and develop problem-solving techniques. “Our classrooms are designed to help students get out of their comfort zone and excel with confidence,” explains Wong. “No child can resist learning in a fun and challenging, yet stress-free, environment.” She incorporates teamwork throughout her process, which increases children’s ability to effectively communicate and helps Wong identify areas in which each child needs extra attention. Wong focusses on interactive teaching methods using dry erase board activities and engaging games that encourage students to absorb information and ultimately gain the self-assurance to present solutions to the group. Instead of traditional tests at the end of each term, Wong developed a “mathscape” room, patterned after the popular escape room trend. Children brainstorm as a team, using math logic and concepts they’ve learned in order to solve the code and ‘escape’ the room. Wong developed the Math Accelerator program in response to her own daughter’s struggles in the subject, and the learning system she created overwhelmingly improved her child’s performance. When her teacher asked what her mom did that made such a difference, her daughter answered, “she played games!” Wong went on to assist other students in her daughter’s school, and saw consistently successful results. Realizing she was on to something that could benefit all young learners, she decided to make a career change. The engineer and technical project manager quit her job at Lockheed Martin, wrote a book about her unique teaching process (The Math Accelerator, available on Amazon.com), and started to build her business. From the outset, Wong’s first goal has been to help students build confidence in their abilities and realize their potential. Working under the philosophy that “everyone can shine,” she carefully evaluates each child and then arranges customized placement in different levels of her program. Wong teaches children from pre-school (“It’s never too early to learn math!”) through high school, is adding programs geared to robotics, directs special family math fun nights, and is contemplating developing a “stay sharp” program for senior adults. This summer, she will be offering a special MEMSA camp (mathematics, entrepreneurship, money management, science & art) to provide another fun and creative learning experience. The MBA is pleased to welcome and recognize Math Accelerator as one of the township’s dynamic new businesses helping to make Moorestown an outstanding community. Photo (L to R) MBA Vice President Kathleen Hiltner, Math Accelerator owner Kit Wong, MBA President Steven Pazienza.